For many of us we love to play multiple games, or play different factions within the same game. In order to pursue different games or factions some players would have to look for different guilds. That brings us to this week’s guild, the Light Knights. They got their start in one game, but that didn’t stop them from branching out to different games, or other factions. To them it is more important to be having fun, rather than spending your time having to find a guild for each game or for any alt characters you want to start on the opposing faction. Can you tell us who you are and how you are associated with the guild Light Knights? My name is Daniel Jones, aka Oane, and I am the founder/community manager for the Light Knights Gaming Community. How did Light Knights the guild get started? The LK community was formed in November 2009. A group of (around) 10 of us previously ran a guild together but this became bogged down in guild politics. The game (Lotro) just wasn’t fun for us anymore so we decided a drastic change was needed. We decided to leave the previous guild and reform into a small guild which avoided politics, or any kind of nonsensical BS, and get back to gaming for fun and enjoyment. As a guild in multiple games, how difficult is it balancing which games and how involved the guild is with each game? How much do the Light Knights rely on internal leadership of the officers to keep the entire guild running smooth? 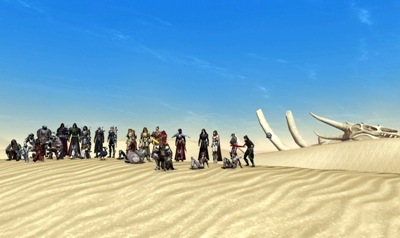 One of founding goals of the Light Knights was that the guild/community would be much more than a single game guild. Very early in my MMO ‘career’ I noticed how easy it was to lose touch with guild mates and friends simply because they moved on to other games. I didn’t like this, and creating an environment which allowed like-minded gamers to build lasting relationships is something I wanted to establish in the Light Knights. Although at our inception the guild was contained solely in LoTRO, it was with SWTOR firmly in mind that I began to build the community with the support of all the LK members. Over the last 3 years we have worked hard trying to make that dream a reality. We have expanded in to (more or less) every western MMO which has been released since 2008. As with everything in our community, we prefer to approach a task from a relaxed point of view- preferring to remember that we are all doing this in our free time; using our experience to resolve problems and find simple, effective solutions. Unfortunately, more often than not, the state of the games which we expand into prevent many guilds from establishing themselves… no matter how much planning has been put in. I always remind my officers that we are constantly treading new ground; gaming communities are a relatively new beast and we should never be afraid to experiment or try something new. If things don’t work out then we learn, move on and use our experience to guide our future plans. We tend to rely on a core set of members/officers to set up/establish new guilds. We feel that it’s important to use the experience these guys have and also be in place to help direct a new guild so that it can more easily aligns itself with the overall vision of the LK. That’s not to say we do not encourage newer members to get involved if they wish to! It has been observed that there tends to be a 2-3 month period following the launch of a new game when everything is a bit intense. You know, people are leveling, exploring, generally ‘playing’ the game and not thinking too much about end game activities and whether they will stick with the game long term. Once things settle down and this period is over we tend to re-evaluate guilds- how are things going/is the officer team of a suitable size/do we need to recruit etc. At this point we more actively encourage those who are playing the game a lot to get involved in the running of the guild. To some extent we do not actively try and balance how involved we are within each game; we simply let situations develop naturally. We do not wish to be ‘massive’ within each game so our numbers tend to normalize at around the same level thus ensuring a degree of balance. Which server can the Light Knights and your Empire counterpart be found? Were they both started on the same server? Before launch we created our Republic guild through the swtor.com guild system which BioWare provided to help server deployment. We had plans to create a Sith Empire guild called ‘Utunni’ on launch with a focus for alt play, but the vast majority of our members were focused on the Republic faction storylines… apart from one LK member. A founding member of the Light Knights, Dagnarr (aka Blade’Dancer) chose a Sith as his main and began walking the path to the Dark Side! Before long he found himself an active guild to join and this small band of players leveled up together and enjoyed PVP renown on the battlefields of our origin server, Nightmare Lands. Fast forward a couple of months and that guild (Legion), now with Dagnarr as its leader became a part of the LK community, replacing ‘Utinni’ as our official Sith Empire guild within SWTOR. 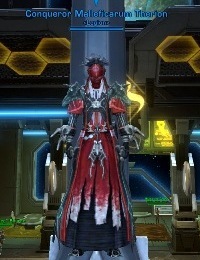 Both guilds have been very successful over the last year and can be found on the EU server Red Eclipse. Being part of a larger guild myself, we have players join games leave and come back. Is this similar in your guild and do you think the new pay model, even Preferred Status will entice some of your members to give the game a try or come back? We have a saying that once you join the LK, you never really leave (unless one is kicked out of course!). We are in a fortunate position that because of our multi-gaming set up, we have the environment in place to remain in touch with those who join our community- no matter what game they play. 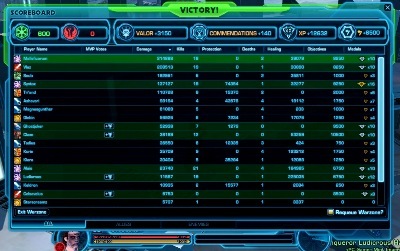 In regards to SWTOR & the new F2P model- we have seen a fair few return to try out the new patch- and it’s been awesome seeing people log back in. Some of our guys have re-subbed to ensure they receive their allocation of Cartel Coins, while other are motivated by the chance to check out the cartel market/evaluate the F2P model and there are those who see this as the perfect time to get back into SWTOR following 5 updates. But, after speaking to many members of the LK community, I would say that the decisions made by BioWare in respect of the F2P limitations are turning lots people off and they aren’t willing to even download the client/update and log in. The UI quick slot limitation is the perfect example of what many see as a broken F2P model which is focusing on the wrong areas. The new system has only been going a few days with the Free-to-Play option, how does the guild feel it is going? How do the members like the Cartel Market? What items would you like to see added in the future? Both factions are progressing well in the endgame Operations. Is the guild as a whole excited to see the new Nightmare Mode for Explosive Conflict? As for Operations, how did the guild feel about the last added content, Terror From Beyond Operation? “I don’t think the entire guild is excited to see Nightmare Mode EC, mainly because we don’t have that many people yet with the right level of gear to actually participate in that version of the operation. Our raiders who do have the correct level of gear are relatively indifferent because it probably isn’t something we are going to do in the first couple of weeks after 1.5 is released. We still have Terror From Beyond on Hard Mode to clear before we can really get started on Nightmare EC. Although Open World PVP has not been very successful, is this an area of PVP the guild would like to see BioWare work to improve? “Concerning Open World PVP I’m a bit conflicted myself… The engine problems are well known, and the first attempt was decidedly less than brilliant. Still, it’s a whole area that is unexploited right now, and lots of PVP players would love an “Ilum 2.0”, so to speak, or at the very least, a larger instanced warzone, similar to Alterac Valley in ‘vanilla’ WOW, since population imbalance is always going to be a problem. The guild Light Knights covers not only multiple games and genres of games, but the guild has its own podcast correct? How did it get started and what type of podcast is it? Yes we do indeed have a podcast. Our first episode went out just over 12 months ago and to be honest was mainly an experiment. I listen to many gaming podcasts (including of course Corellian Run Radio!) and felt like we had suitable people within the community to put together a show which would be something which not only our members would like to listen to, but gamers in general might be interested in. My goal was to have a free flowing, organic show which provided updates on each game we play and then to move on to random discussions (I guess similar to how the Outlandish podcast guys do their show). We have tried out a couple of different formats, experimenting with the formula, changing the length of the show/composition of the panel. We have found it extremely challenging to get the right people, in the right place, at the right time to record any episodes for a long time now so we are looking at better ways to release content (for example via youtube vlog style videos). 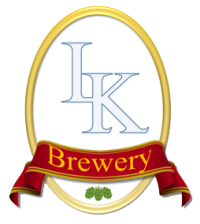 While we are talking about other areas the guild is associated with outside of gaming, can you tell me about The LK Brewery? How did this get started, there has to be a great story here? I always endeavor to add unique features to the Light Knights community and the LK Brewery is a perfect example of how we try and do things a bit differently to other guilds! The purpose of the LK brewery is simply to provide free beer for our social gatherings. I have a personal interest in home brewing and was lucky enough to receive all the kit as a Christmas present from my wonderful partner a couple of years ago (thanks Aeth!). Shortly afterwards I held a community social event for my 30th birthday; and during the course of the weekend we held a Halo competition… the winning team were offered the chance to chug from the Keg (which swiftly resulted in most of the attendees red faced and dripping with beer) this started the wheels in motion of the LK Brewery and ever since then I have provided beer for our social gatherings. We haven’t had any further Keg chugging… but I think we’ll need to remedy that at our next event! Light Knights have organized many events from Datacron runs, PVP contests, World Boss hunts, and some other social events. Does the guild have any coming up soon? Besides the various in-game events the Light Knights are a part of, does the guild have any events outside the virtual world? Although the tools in SWTOR aren’t quite as advanced as they are in some other games (for example chicken session play in Lotro provided for some hilarious events!) we do try and work with the game as best we can in order to run more socially focused events compared to raiding/PVP. On Republic side we ran a Hide and Seek event on Tython last Friday evening and will be looking to hold another inter guild PVP event in the near future. Outside of the virtual realm we regularly hold social events- whether these are gaming weekends at a members house, city visits or trips to Theme Parks, we do love to get together, have a few beers and spend some time getting to know each other that little bit better. To date these have all occurred within the UK but we do want to hold more on mainland Europe and maybe even further afield! If someone is interested in joining the Light Knights, how is the best way to contact the guild and what steps do potential recruits need to take to apply to the guild? We are fairly relaxed in respect to our recruitment requirements. We firmly believe that the LK community is a special place (which our members love being part of) so all we ask is that members are at least 18 year old and are friendly, respectful people… we can do the rest! The best way to apply is via our website recruitment page. Thanks to Daniel for all his work in getting the information to me in such a short time. Also I want to thank the other officers and members of the Light Knights guild for their answers and letting us get to see a bit about their guild community. If you are someone looking for a guild to join on the Red Eclipse server, I would suggest going to their website or looking up any members of the Light Knights or their Empire counterpart, Nightmare’s Legion. This is one guild never short on having fun and enjoying gaming together…no matter what game it is. Would you like to see your guild, event or server group highlighted on Corellian Run Radio? All you need to do is submit your guild’s website and some basic information in an email to me at, jason@corellianrun.com. Your guild or event could be who we highlight next here at Corellian Run Radio. Thanks and see you next week!